Wine and dine your family and friends while giving back this holiday season through Gallo Family Vineyards' Every Cork Counts program, an initiative that supports Meals On Wheels Association of America and its mission to end senior hunger. Now in its 5th year, Gallo Family Vineyards hopes to make its biggest donation to the organization yet. The Winery has already donated $100,000 in 2014 and hopes to ramp up efforts to finish the year strong by enlisting you and your readers to assist in raising an additional $50,000. With the holiday season and the height of entertaining just around the corner, giving back to help the nearly 8.9 million seniors who face the threat of hunger is as easy as popping the top to a bottle of any great-tasting Gallo Family Vineyards wine during all your upcoming celebrations. For each cork returned to the Winery via text, email or mail through December 31, 2014, a $1 donation will be made to Meals On Wheels Association of America (specifics on the return process included below). Over the past five years, Gallo Family Vineyards has collected thousands of corks and donated more than $250,000 to support the needs of seniors in communities across the country. Mail your Gallo Family Vineyards corks or caps to Gallo Family Vineyards 2014 Every Cork Counts, P.O. Box 3017, Grand Rapids, MN 55745-3017. 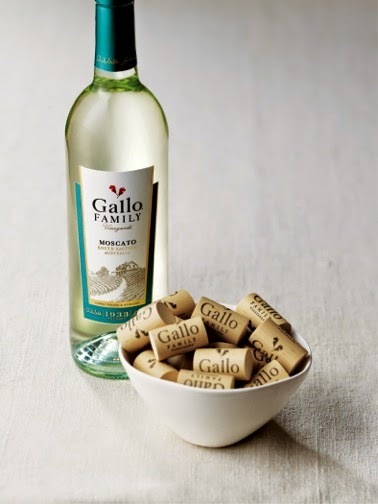 I am a HUGE fan of Gallo Family Vineyards wine - their Moscato is to die for! And their Every Cork Counts campaign is an awesome campaign and easy to be a part of! Offer great wine this holiday season and make a difference at the same time with the Every Cork Counts campaign!